ENGLEWOOD — A proposed rail yard expansion on the South Side has Joyce Edwards and other residents concerned about their health. 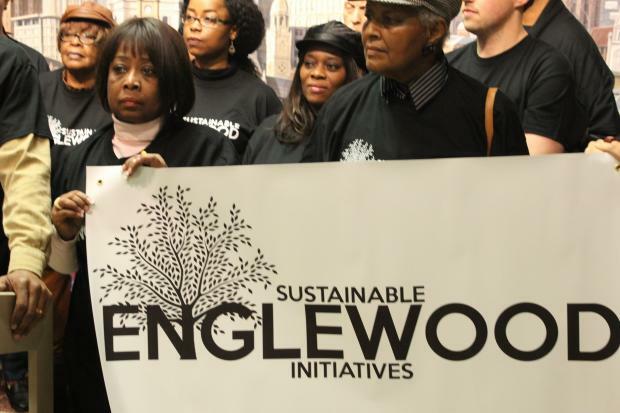 "I have lived in Englewood for 45 years and during that time I have been diagnosed with asthma even though I don't smoke or work around chemicals," Edwards, 57, said at a Thursday City Hall news conference hosted by Sustainable Englewood Initiative, a community group. "Now I have grandkids living with me and I am concerned about their health and them possibly getting asthma like me." Norfolk Southern Corp. has outgrown its intermodal facility at 361 W. 47th St. and is seeking to expand it, said Robin Chapman, a spokesman for the company. "Traffic volume has outgrown our existing facility, and we need to expand to improve the yard’s efficiency and reduce rail traffic congestion moving through Chicago," said Chapman. "Increasing our capacity at the yard will bring economic benefits to the region by making it easier for companies requiring these transportation options to do business in the area." However, before expansion could begin, Norfolk must first acquire city-owned land and possibly other homes, such as Edwards', located near the expansion area from 55th Street and Stewart Avenue to 61st Street and Wallace Avenue, according to John Paul Jones, president of Sustainable Englewood Initiative. "Residents are being offered peanuts for their homes by Norfolk," said Jones. "We want the city to take a second look at this land sale before signing off on it. Economics and corporate profits should not come before the safety and welfare of our children." Joyce lives in the 5900 block South of Wallace and said she does not want to move. "I love my home. This is where my kids grew up and where I have a lot of good memories, and now Norfolk wants to take that away from me," she said. Many Englewood residents have asthma as a result of polluted air, said Brian Urbaszewski, a spokesman for the Respiratory Health Association of Metropolitan Chicago. He added that exhaust fumes from trains could trigger an asthma attack, and in Englewood many of its residents have asthma. While blacks historically have higher asthma rates than other ethnic groups the Englewood community has been hit hard, said Urbaszewski. "You don't see these kinds of environmental problems in more affluent communities," added Urbaszewski. According to the Merck Childhood Asthma Network, a non-profit health organization in Washington, D.C., asthma related hospitalizations in Englewood and West Englewood are among the highest in Chicago at 60 percent and 71 percent, which is more than double Chicago’s average of 31.6 percent. Clergy leaders also oppose the expansion. "Most of my members live in Englewood and a lot of them have breathing problems," said Harriette Cole, pastor of Englewood United Methodist Church on the South Side. "I am all for economic development but only when it is done responsibly." The Rev. John Ellis said he is no longer a pastor at a church but does live in Englewood. "Englewood has been my home for 25 years and I do not want to see anymore damage come to it," Ellis said as he struggled to stop coughing. "I have had a bad cough for three years and my doctors cannot figure out what's wrong with me. I have never smoked and I do not drink but I can't stop coughing. Gee, I wonder why?" The proposed site for the expansion is within Ald. Pat Dowell's (3rd) ward. "I support Norfolk Southern's initiative to expand their intermodal rail yard and the city's intention to sell 105 parcels of land to the railroad," Dowell told DNAinfo.com Chicago "I am also supporting the residents in their efforts to address concerns regarding the environmental impacts of the project." Dowell said she asked the city's Department of Housing and Economic Development to postpone the sale of the property until a March meeting of residents, Norfolk Southern representatives and city staff. Thomas Murphy, a Chicago attorney representing Norfolk, said he is scheduled to meet with Sustainable Englewood on March 14 to discuss their list of demands for an expansion. Those demands include for Norfolk to test, monitor and mitigate diesel pollution and lead contamination; build green space for residential use; and distancing the worst noise and air pollution areas from homes and businesses.